I went to Houston recently, and I decided to knit on the plane. I had blunt suitable-for-children scissors and bamboo straights (US8/5mm). And Lily Sugar 'n Cream cotton. Neptune Ombre (220): the smaller cloth was done with 35 stitches and 17 stockinette repeats, mostly because I wanted to see how that would affect the zigzags. Westport Ombre (2012): the smaller cloth was a mitered garter square. My first time doing one of those. There's a mistake, but it's not so visible from this side. Butter Cream Ombre (222): the smaller cloth is a variation of feather and fan, where there were two knit rows between the pattern rows, instead of 2 knit rows and a purl row. Worked over 36 pattern stitches and two selvage stitches, with 13 pattern repeats. 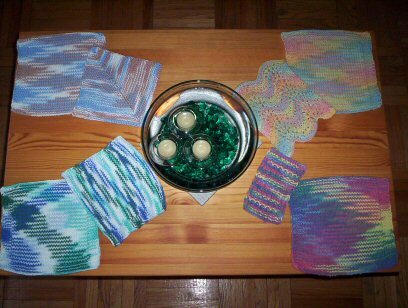 Rainbow Bright Ombre (200): the smaller one is my standard dishcloth. I prefer dishcloths that just barely cover my hand, like this one. Cast on 16, alternate 2 rows of garter with 2 rows of k1p1 ribbing, ending with garter. I stop at 9.5 repeats and bind off. So, that's what I did on my vacation!